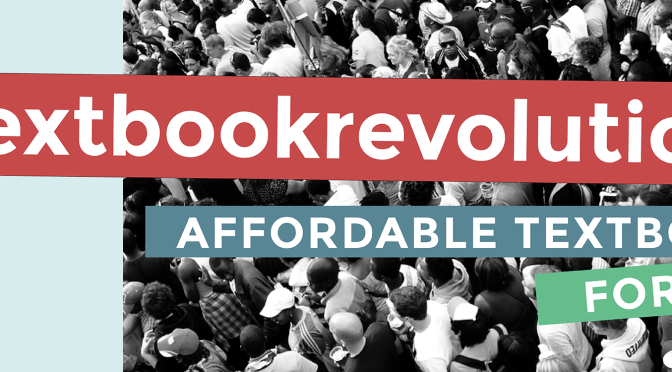 This week we kick off the #textbookrevolution, a movement to end the high cost of textbooks. Here is the #textbookrevolution manifesto in 75 seconds. At South African universities, less than half of students buy textbooks. They are too often expensive, out of stock, hard to find, and longer than necessary. The culprit? The supply chain: printing + shipping + warehousing + wastage + retail = 70% of the price. That’s crazy. There is a better way. Textbooks can be printed on demand in any copy shop quickly and legally. Legal copy-shop printouts cut textbook prices by up to 40%. And publishers and authors still get paid the same. This could save R1000 for every student in South Africa. That’s a billion rand every year to spend on more important things, like food and housing. It’s time for a #textbookrevolution. Lecturers and authors: Insist that publishers put textbooks on Paperight. Universities: scrap monopolies for campus bookstores. In theory, ebooks would solve this problem, but ebooks present many challenges of their own, including high setup costs, poor reader software, clumsy DRM, the need to buy with a credit card, and device and data costs. Many students simply prefer paper. Paperight shortens the supply chain by replacing traditional retail, printing, shipping, warehousing and wastage with a simple copy-shop print-out. This could save most students up to 40% off their textbook bill – that’s thousands of rands every year per student. The retailer, printer, shipping companies, warehousing, and wastage provisions eat up about R350. The traditional supply chain pays the publisher about R150, which covers all their costs and the author’s royalties. The copy shop pays a licence fee of, say, R200. The publisher earns R160 after Paperight’s 20% commission. The copy shop prints out and ring-binds the book, shrunk imperceptibly and placed two-up on 200 double-sided sheets, for R120. The copy shop charges the student the total, R320, saving them R180 (36%). There are never stock shortages, these ring-bound books lie flat while studying, and they’re often easier to mark up with notes and highlights. In the end, our message is simple: it’s time for a #textbookrevolution: textbooks don’t need a bloated supply chain – they can and should be cheaper. That revolution starts with Paperight. What are some real student examples? Yazeed Peters works full-time and is studying part-time through UNISA. He’s studying economics, accounting, customer service and marketing. He needs six textbooks that together cost at least R2240. If they were available from Paperight outlets, he’d pay only R1310, and save R930 – a saving of over 40%. Tshegofatso Masha is studying first-year civil engineering at UCT. He’ll do twenty courses this year, for which he needs to buy 7 textbooks. In a store, he’d pay about R7175 for these. If they were available on Paperight, he’d pay R5126, saving R2049 – 29%. And that includes the cost of printing out a 1000-page, full-colour, A4 textbook. With Paperight, he’d only have to print what he needed from it, saving even more money. Philippa Dewey is studying final-year law at UCT. The seven books she’s prescribed would cost R4300 normally. From Paperight outlets they would cost her only R2500. She’d save R1800, 42% of her textbook bill. In every case here, the publisher still earns the equivalent of 30% of the retail price of the traditional book, which for many publishers matches current gross margins including equivalent royalties in rand terms. How does Paperight work in stores? A student walks into a copy shop, asks for a textbook, and the copy shop prints and ring-binds it within hours or even minutes. Every page includes the names of the student, copy shop, and publisher, and the date of purchase. How is this possible? We work with publishers to provide an online library of books that copy shops can legally print out. For each print-out, they pay a licence fee from a pre-paid account. The copy shop makes money from the printing. Publishers can set their licence fees to make the same gross margin they’ve always made (about 30% of the retail price for most publishers). Paperight gets a 20% commission on the licence fees. So, by replacing traditional printing, warehousing, shipping, wastage and retail with a simple copy-shop print-out, we can reduce final cost of a textbook by 40%, with no loss to the publisher. This is nothing short of a revolution in textbook delivery, dramatically reducing the overall cost of tertiary education. If, starting today, we could save every university student in South Africa R1000 a year, then at current inflation and enrolment-growth rates, by 2030 we’d have saved them a total of R52 billion. To make this saving a reality, we are up against four key challenges. Publishers mistrust copy shops after years of rampant piracy. Even though Paperight distribution is logically better than having your books photocopied anonymously, publishers struggle to overcome their long-standing unease. As a result, they are reluctant to put core textbooks on Paperight. Copy shops have to learn new tricks, especially how to promote books. They also have to train their staff members on how to use paperight.com. We do broad PR and provide promotional materials and support, but ultimately they have to do the local legwork. University bookshops have exclusivity on campus. Usually, only one retailer is allowed to sell textbooks on campus – potentially preventing copy shops on campus from selling Paperight print-outs. In theory, this secured market should help bookstores give better service to students. In practice, it creates a sheltered monopoly with no competition effects. Lecturers don’t enjoy changing the books they prescribe. But to make textbooks much cheaper for their students – to improve purchase rates and student performance – they need to choose books that are on Paperight, or pressure publishers into putting their books on Paperight. Lecturers are the most powerful customers in the textbook industry. What are we asking of people? Each player in the textbook ecosystem has a part to play in the #textbookrevolution. Lecturers who prescribe books are the most influential people in publishing – they have tremendous power to change things for the better. We want them to ask publishers to sell their prescribed books through Paperight, too. Students are at the heart of the #textbookrevolution, it matters to them more than anyone. So we’re asking them to spread the word that there’s a better way. University administrators can grease the wheels by getting campus copy shops and book shops to join Paperight; they can distribute tutorials through our network; and use their mailing lists to tell people about the #textbookrevolution. The #textbookrevolution is bigger than Paperight: there are many other ways that publishing can reduce its bloated supply chain to cut the cost of tertiary education. That’s why we’re not calling this the #paperightrevolution. We just want to play our part, alongside others, in getting more students through university well-educated. We’re deeply grateful to the publishers and copy shops that have already joined the #textbookrevolution, even though many have only taken baby steps so far. We need many, many more allies to make this a reality. Please spread the word: it’s time for a #textbookrevolution.